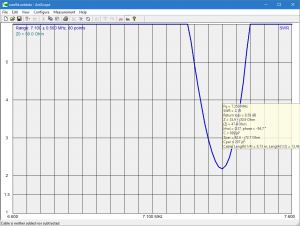 Above is the sweep, but it is quite inconsistent with the transceiver’s VSWR meter readings. 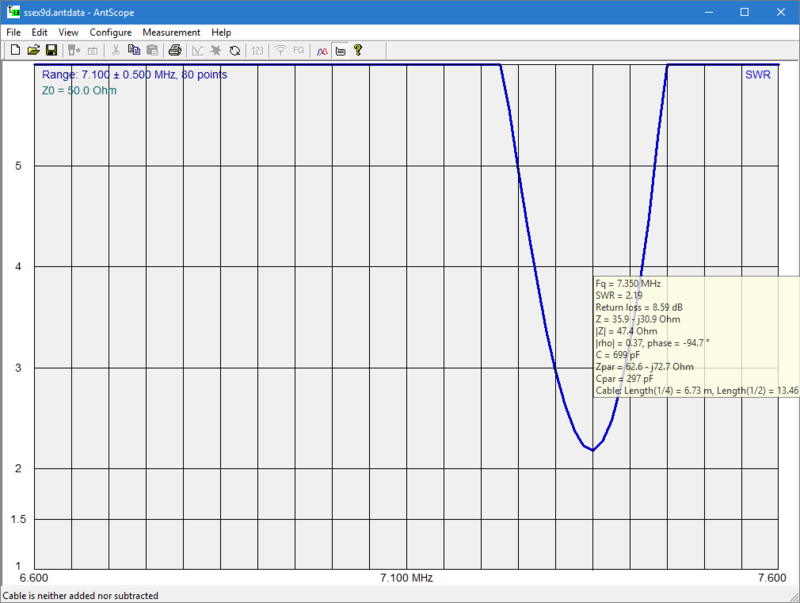 The plot above looks good, a little adjustment of the tip would get it down to 7.060… but the transceiver does not see it that way. How often have people reported that sort of thing? It is very common. Which is to be believed? Online experts will advise not the trust transceiver VSWR meters, they aren’t any good so go with the analyser. They can’t both be right… or can they? Above is a rerun of the sweep where the analyser coax shield is held in contact with the transceiver coax connector body so that we restore the common mode current path (the path for RF current on the outside of the shield). The sweeps are very different, and what is more, the last sweep is consistent with the transceiver VSWR meter. The issue is not about whether the transceiver VSWR meter is correct or not, the issue is about correct application of the analyser so as to measure the SAME thing. I mentioned earlier problem identification / tuning. Having made a measurement now that seems valid, let’s move on to problem identification. This antenna is the same one used in some earlier articles and tuned to 7.064MHz. Why is it now so high when mounted nest to the other mount on a magnetic base? 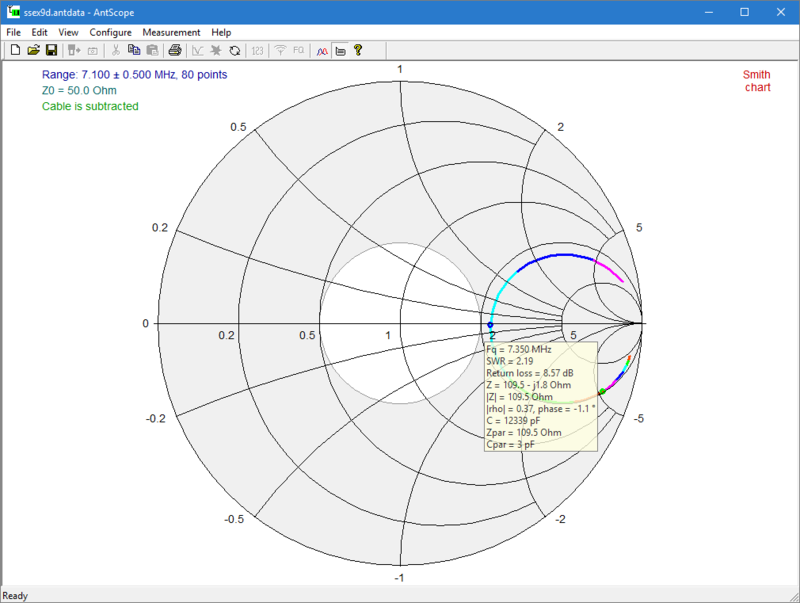 Let’s look at a Smith chart view with the 3.55m of RG58 feed line backed out, this is Z at the feed point. 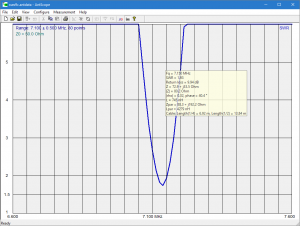 Not only is the frequency of minimum VSWR almost 200kHz higher than the other mount scenario, the R value at resonance is 100Ω instead of 20Ω. The large difference in resistance gives the strongest clues that there is a problem. 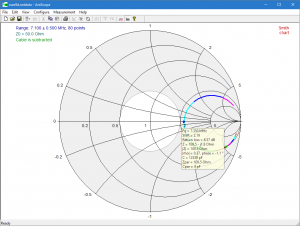 The magnetic base does not effectively connect the shield at the feed point to the car body, and so the coax carries substantial common mode current, the coax shield becomes part of the radiating system. That is also evidenced by the fact that the impedance sweep changed so much when the source end socket was connected to the transceiver chassis. Sure, you could probably lengthen the tip or play with the feed line to get the VSWR minimum down lower in the band… but there is a problem, this magnetic base is most unsuitable for this type of antenna.